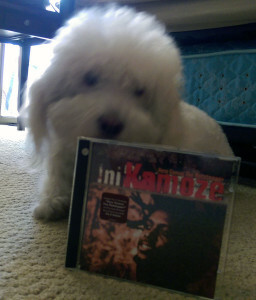 It’s Ini Kamoze’s Birthday And I Need To Dance! I’m reading NLP: The Essential Guide to Neuro-Linguistic Programming, subtitled Creating the Person You Want to Be, by Tom Hoobyar and Tom Dotz with Susan Sanders. The book teaches one how to think, as opposed to what to think. Of the many exercises in the book is one the authors call “Creating a Well-Formed Outcome.” You list things you want and answer six questions related to each want. Within those six questions is an exploration of “meta-outcomes.” To explore the meta-outcomes, one must keep asking what will happen if I achieve this goal. For example, one of my goals is to have a leaner physique. Using this exercise, I say “When I am leaner, I’m more confident. When I am more confident, more guys will be attracted to me. If more guys are attracted to me, I’ll date more often. If I date more often, I’ll end up with a boyfriend. If I have a boyfriend, I’ll have someone with whom to watch movies, dance, and share other activities I enjoy. If I do more activities I enjoy, I’ll be “in the flow” more often. If I am in the flow more often, my happiness will increase. Another goal I have is to work with more clients. If I work with more clients, I’ll make more money. If I have more money, I can partake more often in the activities I enjoy. If I partake more often in the activities I enjoy, I’ll be in the flow more often. If I am in the flow more often, my happiness will increase. Now you try it. What is a goal you have? Keep asking yourself what will happen if you achieve each part. If you don’t end with me being happier, you’re doing it wrong. Start over! Something that makes me happy is dancing. Friday is dance day at Tunes du Jour. Today happens to be the birthday of John Lennon. As he never hit the Billboard dance charts, we’ll kick off this week’s party with someone else whose birthday is today, Ini Kamoze. More accurately, today is the 58th birthday of Cecil Campbell, who later changed his name to Ini Kamoze. Here are twenty songs you can hotstep to.